Tiny Sunbirds, Far Away [Book Review] – my books. my life. When her mother catches her father having an affair, 12-year-old Blessing is uprooted from her comfortable life in Lagos to her grandparent’s home in Warri, Nigeria. At first, living in the remote village is hard. There is no running water or electricity, school (when they can afford the fees) is miserable, and Ezikiel, Blessing’s older brother whom she adores, starts to drift away from her. But once Blessing settles in, she begins to discover who she really is and who she wants to become. Through Blessing, we are confronted with the harsh realities of life for the Nigerian people: war, poverty, genital mutilation, and ethnic strife. But we are also shown the beauty: family, perseverance, pride, and, most of all, love. Blessing is abandoned by her father, ignored by her mother, and pushed away by her brother. She finds comfort spending time with her grandmother and learning her trade. The love Blessing shows for her brother, Ezikiel, despite his erratic behavior toward her, is refreshingly pure. She looks up to him and would do anything to save him. She constantly worries about his allergies and his asthma, encourages him in his aspiration to become a doctor, and turns to him when she is scared. Brother-sister relationships can be very complicated and Watson captures that complexity. Tiny Sunbirds, Far Away does not shy away from the sensitive issue of genital mutilation. Blessing learns about cutting from her grandmother and the complications that can arise, especially during childbirth. This is a practice that has not yet died out and by facing it head on in a novel, Watson ensures that we here in the US will not forget about it. I can certainly respect an author who brings a human rights violation like this back into the discussion through a novel. The novel is full of tension: the poor people resentful that others are made wealthy off their oil-rich land; the traditions that have to battle with progress, and the personal relationships of the characters within the story. As for those characters, Watson does an excellent job of creating unique and memorable individuals, like Celestine, the large and silly second wife of Blessing’s grandfather, and Blessing’s grandfather Alahji himself, a self-proclaimed expert petroleum engineer who never actually has a job and believes Marmite can cure anything. These people do not make Blessing’s life easy, but they certainly make her story interesting. I don’t think I stopped crying for the last 75 pages. I was enjoying the book very much, but the emotional rollercoaster it took me on at the end solidified my love. And, although I had my doubts at times, I was very pleased with the ending. 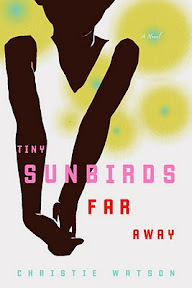 Tiny Sunbirds, Far Away is an impressive debut and a beautiful coming-of-age story. I am happy I was able to spend this time in Nigeria with Blessing. I hope you all have a chance to read it. “Do you want your inhaler?” I whispered. “I’m fine,” he said, but his eyes flew around his face. *Page numbers refer to the e-galley and may differ in the published version. I think I also read a really good review of this book over on Amy’s site. It sounds like a book that I would love, and I am interested in the fact that it is so relevant and topical. Great review on this one. It’s going on my wish list right now! This sounds like an absolutely amazing book. If a book can make you cry for 75 pages (without being manipulative, which it doesn’t sound like it is) then the author has done something special. Plus, I really need to get out of the US with my literary settings. Great review, Michelle! It sounds like a very interesting book. I just realized that I haven’t read many novels set in Africa and I added that to my tbr list. Also, I have a brother myself and what you wrote about Watson, capturing the complexity of brother-sister relationships, really interested me.